The Colorado River, the source of much of the American West’s economic productivity, essentially functions like a bank. This month, the nation’s largest water agency, the Metropolitan Water District, began what amounts to a run on the bank. Metropolitan officials are worried that the federal government is about to step in to ration the river, which 40 million people depend on as it flows some 1,300 miles from its headwaters in Wyoming and Colorado to the Sea of Cortez in Mexico. All this is happening because an ongoing drought along the river has collided with years of overuse by the states, primarily California and Arizona. In recent years, states realized their problem and began trying to create “surplus” water in Lake Mead and bank it for use in future years. But those bank accounts get frozen if the lake’s elevation is below 1,075 feet at the start of a year. Water agencies would still be entitled to annual flows from the river fed by snow melting in the Rocky Mountains, but that’s like living paycheck to paycheck while working for a fickle boss or nearly bankrupt company. 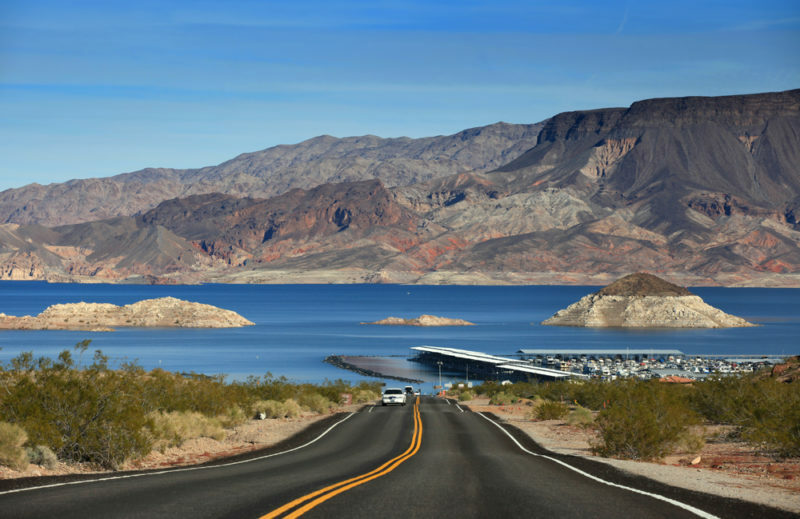 Metropolitan’s immediate concern is that it will lose the ability to withdraw 600,000 acre feet of banked water from Lake Mead – enough water for roughly 7 million people. The district can only get half of that out this year, meaning it is in danger of losing lots of water. How that happened is the result of a complex, arcane and absurd accounting system. The system – used now by seven states and two countries – tries to correct a historic mistake. Starting in 1922, officials gave cities and farms rights to more water from the river than the river usually holds. Now, like people who borrow money to get out of debt, we’re in a world where there’s more water on paper than there is in the river. Metropolitan is trying to get all the water it can out of Mead before someone freezes its bank account. That means moving water into reservoirs within California’s borders – beyond the reach of the federal government’s rationing or other states that claim the river’s water. Tom Buschatzke, the director of the Arizona Department of Water Resources, said in a statement that he knew Metropolitan would begin trying to get its water out as quickly as possible. “We are not surprised,” he said, noting that the rapid draw down is one of “many reasons” why Arizona needs to reach a deal soon. Now, the federal government may step in. Brenda Burman, the head of the Bureau of Reclamation, the agency within the Department of Interior that oversees the river, said she is done hearing how close everyone is to reaching a deal, something that officials have been saying since at least 2016. A century ago, the river was divided up on paper into an upper basin and a lower basin. Each basin is supposed to split the available water evenly, but most of the water comes from the upper basin and most of the people live in the area served by the lower basin, which includes California, Arizona, Nevada and Mexico. That means, in effect, the upper half of the Colorado is exported to the lower half. That’s not always enough, though. A federal appeals court disagreed with the tribes’ arguments on legal grounds, though didn’t quite deny they had a point. “Whether or not the Nation’s realpolitik predictions have some truth to them,” the predictions were too speculative to allow the case to proceed, the 9th Circuit Court of Appeals found. But they are likely signs of bigger things to come. Dan Denham, the Water Authority’s assistant general manager, said San Diego could leave enough of that water in Lake Mead to raise its elevation by three feet. The Water Authority says it doesn’t need all that water right now. Part of that’s because water demand has unexpectedly fallen in recent years, thanks in part to a mentality of conservation that Californians adopted during Gov. Jerry Brown’s drought emergency. There are also financial considerations – the Water Authority isn’t keen to pay for all of that Imperial water, wants to resell it, or some combination of both. For years, the Water Authority was in court arguing Metropolitan charges too much to deliver the Imperial water to San Diego. In fall 2017, the Water Authority lost the biggest part of that battle, which means we’re pretty much stuck paying high “wheeling costs.” Storing water in Lake Mead would at least temporarily reduce those wheeling costs to nothing, saving the Water Authority money. Second, there’s a chance the Water Authority could resell the water to someone else on the river, a new twist to what was already the biggest water deal of its kind in American history. That might cause a ruckus in Imperial, where some farmers already believe San Diego isn’t paying them enough for their water. Imagine if the Water Authority then made money reselling that same water. The idea hasn’t progressed a whole lot since then, in part because the Water Authority needs Metropolitan’s aid to start banking water. Water Authority board Chairman Jim Madaffer has tried to make storing water in Mead a key part of any legal settlement between the Water Authority and Metropolitan in litigation that is ongoing. So far, Metropolitan, wary of doing any deals with the Water Authority after years in court and at odds, has expressed no public interest in that idea. For now, as the amount of water in Mead continues to decline, Southern California is blessed that it is not solely reliant on the river – it gets water from both the Colorado and the rivers of Northern California. “We don’t know where we can get it, but if we have to get a significant amount of water in a hurry we know it’s going to be more expensive,” Hasencamp said.